Tesla has just released its Q2 2018 earnings and financial reports. That’s significantly higher than the predicted loss of just $2.71 a share. 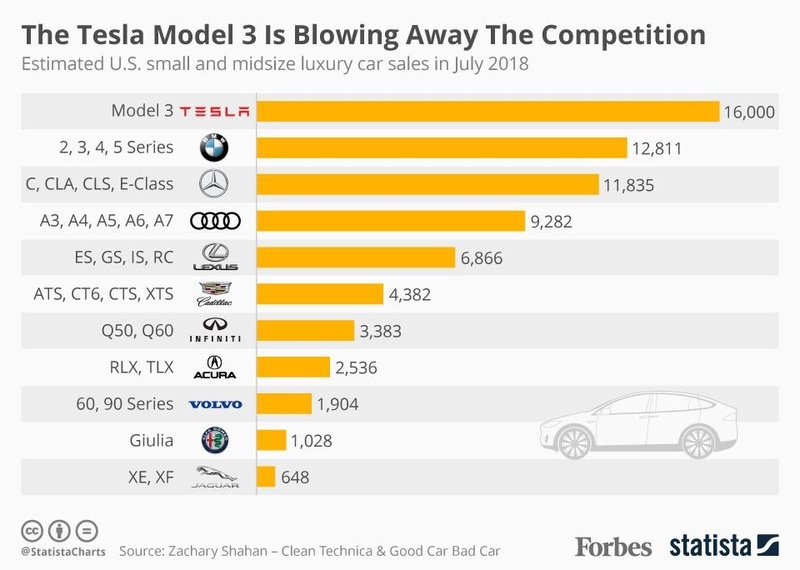 In July 2018, Model 3 not only had the #1 market share position in its segment in the US, it outsold all other mid-sized premium sedans combined, accounting for 52% of the segment overall. The popularity of Model 3 is a true testament to the product. Based on trade-insthat we’ve received so far, we can see that the total addressable market for Model 3 is much larger than mid-sized premium sedans. We are drawing customers from many other segments, including non-premiums sedans and hatchbacks. Demand for Model S and Model X vehicles remains high, with Q2 2018 being our highest ever Q2 for Model S and Model X orders. In July 2018, we delivered our 200,000th vehicle in the US, which means that our US customers will have access to the full $7,500 federal tax credit until the end of 2018, at which point it will phase out over the course of 2019. We produced 53,339 vehicles in Q2 and delivered 22,319 Model S and Model X vehicles and 18,449 Model 3 vehicles, totaling 40,768 deliveries. Additionally, we recently started taking requests for Model 3 test drives in July and have already received more than 60,000 Model 3 test drive requests in the US alone. Most stores in North America were just getting Model 3s for test drives in July 2018. Early results indicate that the Model 3 test drive-to-order conversion rate is higher than for Model S, so weekly orders should grow significantly in upcoming months. 41 Comments on "Tesla Posts Q2 2018 Earnings Results"
Ouch, that is a huge loss… But cash position is better then I expected. Fair. $3.06 per shr loss, on 2.71 consensus. Cash is probably driving the stock above $315 (after-hours). On (-900) million consensus use of cash, looks like they used only (-500) million, or .5 billion. -Really tough on the bears, because “2.7 billion, to 2.2…” is harder to get to bankruptcy, than “2.7 to 1.8, to .9…..”. They’re saying no cash burn in Q3, anyway. Nothing about cap raise for Semi or Y (yet). One-time reorganization costs was a big part of the delta. Wall street didn’t take that into account. But to be fair, wall street almost never gets one-time’s right for any company, unless there is massive media attention on it ahead of time. And while Tesla came in below the loss per share numbers, they came in WAY above on the revenue side. 4B in total revenue, way over consensus!! And revenue growth is a greater forward predictor of success than loss per share during ramp-up. Because ramp-up is another one-time expense. The loss from Operations was 621M, and the Net loss was 743M, the one time charge for the reorg was 103M, they categorized it separately in the OPEX. With 169,794,000 shares outstanding, 103M is 61 cents per share. The delta between ” $3.06 per shr loss, on 2.71 consensus” is 35 cents per share. Getting the estimate on the one-time’s wrong clearly more than covers the delta. Again, history of Wall Street getting one-times like reorg costs wrong is very high. So focusing on missing on consensus by 35 cents when one-times was around twice that is ill-informed. Oh, and you don’t mention that those losses are actually DOWN substantially from Q1, on the way to Q3/Q4 and forward sustained profits per share. Not surprising you completely ignored that Tesla also reported higher than expected sales of $4 billion in the second quarter, a 46 percent increase from $2.8 billion in the same quarter last year. So they officially hit the 200,000 mark in July, like owners wanted. And Model 3 is getting broader appeal, too. Sounds like good news for everybody! “Trade-ins that” we’ve received so far! Oops, Tesla edit! Damn should have bought some today. Some fool sold a ton of stock at market open this morning. The stock is already above $300 in after hours. I’ll check tomorrow morning, maybe the idiot will do the same thing. Headed over $315., with 1 mil. + volume already, in after hours trading. Some obvious short covering, before the Thursday 0pen! Watching for a move approaching $320+., to close out the Friday session. Hopefully, another FOOL will sell Big Volume early tomorrow morning to drive the price down again, for another BARGAIN. Could be people DUMPING out of Einhorn and Chanos funds. After hours short squeeze is currently Einhorning Chanos “in the shorts”, or, as has been heard, in the Thai cave diving, and child rescue community, “where it hurts”! One thing about TSLA is that it is highly volatile. Lots of swings still to come, even with the undeniable overall long term upward trend over the life of the stock. You gotta get the clicks, man! Since Tesla sells more plug ins than all other carmakers combined in the US and its survival depends on selling plug-ins at a profit, unlike all other carmakers that happily subsidize their plug-in (compliance)products with the proceeds of ICE sales it’s financials deserve special attention. There is nothing newsworthy in that. BYD is a giant, mature and solid company with very little growth and all of it organic compared to Tesla. Gross margins on Model 3 must be south of 15% if 3, S and X combined is 21%. That needs to improve a lot before you’ll see a $35K Model 3. And on the Model 3 vs everyone else graph. Nice to exclude enough competitors to tip the scales – Like Cadillac ATS, Infiniti G, Acura TL, etc. On the call, they said “3%” margin Q2, goes to 15% for Q3. It was the one thing Tony S. questioned, as “$6,000” per car Tesla needed to find savings from. Elon answered “low volume tooling” to redo flawed parts is a substantial issue $$ they are working around. Later in the call they optimistically targeted 20% in Q4 and 25% in 2019, barring any unforeseen events. Great upsell on the trades! Cadillac ATS, Infiniti G, and Acura TL have a very small tip, even when you add in lots of other models by the same brands besides just those 3. FYI — Infiniti stopped selling G’s in the US quite a while ago…..
Model 3 gross margin was slightly above zero in Q2. Mostly because they weren’t at full volume yet. They’re getting closer to full volume now, thus the 15% forecast for Q3. Like it or not, Tesla *must* turn the corner soon and become profitable. Otherwise, their suppliers could get nervous, shut them off, and then the revenue stream stops. Thats true, but Tesla’s cash float position is still pretty strong… I think they will be OK, as long as the cars keep selling at a high rate and the mix is more to the expensive models. Musk said the same thing a few months ago (minus the drama about suppliers). Which is why they announced in the call today that they are highly confident of sustained profitability starting in Q3 and forward…. Not so coincidentally, this happens to be exactly how Tesla’s 2009 “secret plan” explained what they were going to do over the long term. It’s 2006 secret plan BTW. Doh! Thanks for the correction! 2006 is correct, I got it wrong with the 2009. Umm, because Tesla is unable to tax its future customers. He actually has a point. Ford is a century old, and still borrows money. Financial aren’t your thing?! That made me smile! Is Jay still hanging around in the back room there? He used to seem like a serious finance guy. I have no idea who either you or David Green is (and I don’t much care), but you’ve made a very serious accusation without proof. Either provide proof he’s a “paid dis-informer” or apologize. This is the kind of garbage that will drive this site into the nearest ditch, if left unchecked. It was immediately deleted. We don’t tolerate such accusations. What garbage are you talking about? Lou was simply pointing out that someone made an accusation against you and used your name. He was correct to say that the person shouldn’t make such blatant accusations about someone without proof. I had since deleted the other comment, so he couldn’t respond to it. Lou’s comment surely wasn’t against you, but rather saying that people might not want to say such things about someone else. I never listen to the conference call following the earnings report, but I watched as the Tesla bulls on the Tesla Motors Club forum discussed things. Nice to see opinions of people who are so very well informed on the subject. They were very, very happy with the conference call. Multiple comments of “best conference call ever”. Stock price up 9-10% in after hours trading, so obviously the consensus from investors was very positive. I’m feeling more than a bit of schadenfreude towards Tesla “shorts” who have just had their shorts put into the wringer AGAIN! Whose figure was that? Others were citing a predicted loss of $2.88 per share. Still the biggest loss per share ever for TSLA — at least, I think that’s what the investors were saying — but not much worse than predicted.